SAN FRANCISCO--(BUSINESS WIRE)--MbientLab, a company building the next generation of sensors and tools for the healthcare industry, has announced the availability of its MIOTherapy (MIO) wearable technology for physical and occupational therapists. 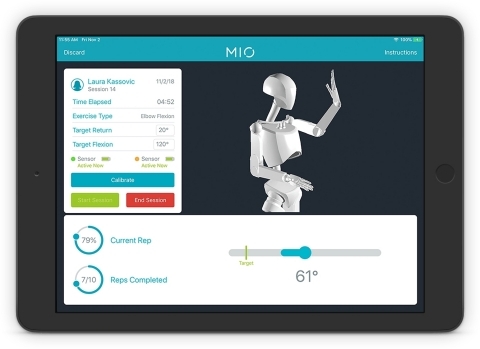 MIO is the first wearable technology platform that integrates the effectiveness of traditional physical therapy with smart sensors, therapeutic exercises, games, and 3D visualization technology to personalize and improve outpatient rehabilitation and accelerate recovery. MIOTherapy is the first wearable technology that integrates the effectiveness of traditional physical therapy with therapeutic exercises, games, and smart sensors to improve outpatient rehabilitation and speed up recovery. Visit www.miotherapy.com or follow @miotherapy on Twitter, @miotherapy on Facebook and @miotherapy on Instagram for more information. MbientLab is building the next generation of sensors and tools for the healthcare industry including motion capture and analytics, biometrics, kinematics, industrial control, research and product development. Visit www.mbientlab.com for more information. 1 Picha KJ, Howell DM. A model to increase rehabilitation adherence to home exercise programmes in patients with varying levels of self-efficacy. Musculoskeletal Care, 2018; 16:233-237.